I've been on 3 weekly perjeta and herceptin for almost 3 years after diagnosis with mets in 2016, and everything has been going great. Unfortunately, recent scans showed some enlarged lymph nodes, and my onc is keen to attack swiftly. She has recommended that I change to Kadcyla as soon as possible. My concern is that I live 2 hours drive from my treatment centre, work full time and raise my daughter (8) on my own. At present I drop her at school and drive over for treatment, then drive myself home after. 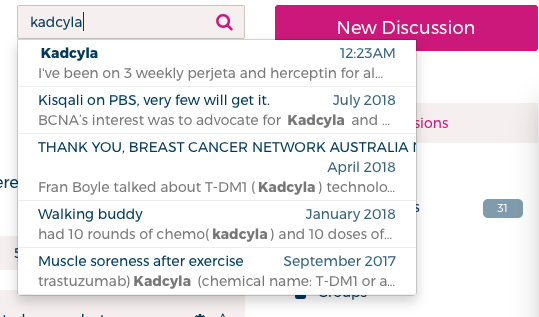 How do others on Kadcyla find the treatment? It contains chemo drugs, so will I be able to drive myself home? This treatment will continue indefinitely, so will working full time be sustainable? All thoughts and opinions greatly appreciated! I don't know but I am posting so this will go to the top of the listing again snd someone may see it! If you click on 'Discussion' you will see a search function just up & on the right hand side. I just put 'Kadcyla' in the 'Search Box' and half a dozen threads popped up, that you can click on, one at a time - some may have info in them to help you with info on it. You can then put another word in if you want to search that as well. @wendy55 any suggestions of somebody who may know? Hi @primek, sorry I cannot think of anyonewho is on Kadclya at the moment, I havent been around the last few days, started my chemo regime on Friday and its knocked the socks off me for the time being, its my body just getting used to it I do hope someone else can help, at the moment all I want to do is lay on my bed!!! give me a few days and I will be up and running again. Take it easy @wendy55. Rest up. Hi Ladies @kmakm and @primek, what a difference a couple of days can make, I have spent this morning bawling my eyes out, I feel alive again, my feet are almost healed and my hands are back to 50% capacity but the biggest improvement is that my brain fog is almost gone, I actually wanted to dust and polish furniture this morning, something I have not been able to do for many many months like 34, I wanted to give my oncologist a big kiss!!! my new regimen is anti nausea medication one hour before breakfast, then take my medication 4 capsules, then I know I will be pretty flat lined for at ;least 3 days, then to wake up like I did this morning halleleujah - I think thats how you spell it, then I have until Friday morning to do what I want, so its a once a week thing, weekly blood tests, monthly blood tests and it just means that every 4 weeks we now go to the oncologist instead of every 6/7 weeks, but hey I dont mind if I can feel this good, the choice of oral versus iv was because - a. we live over two hours aways, b. I would need a port, this drug is so toxic it cannot go in via your vein in your arm,well thats my oncologists view, I will only lose a little bit more hair, but hey who cares, just having my hands back is the best feeling in the world, to be able to put my hands in water and not feel like they have been doused in petrol, and to pick up a duster and be able to use it, and wear thongs, silly little things I know but you dont realize how important your hands are until you lose the use of them!!! and as a real bonus it is soo much cooler today, to sit outside and have a coffee with a beautiful cool breeze blowing on your face, heaven, so ladies I am off to go shopping, woo hoo!!! and lets hope the cool weather sticks around, its been horrendous for so many in particular those of us on ANY sort of medication, it just knocks you about so much, so life is good, I will take it easy I am not going to be silly and go overboard,so ladies, thank you, thank you, to you and to everyone on this forum who has encouraged and supported me in any way, somedays it was just enough to read a friday funny or a naughty one or a look at a positive thought that kept me going, reading some of the amazing stories they you all have to tell, looking at your gardens or walks, I loved the roos drinking from the bird bath! so onwards and upwards from here, XELODA, you did the job, but at what a price, still, I am here and intend to be for a very long time!! I just went and for the first time since we got our beautiful rescue dog 10 months ago I was able to sit and brush her coat and actually feel my hands working!!! I am so grateful, I know xeloda was tough, but I am tougher!! so take that cancer and put it where the sun dont shine, I am pretty happy cant you tell!!! Hey @wendy55 ; you've just put a big smile on my face reading your post. I can hear your excitement in the words @wendy55 ; Go, girl! What wonderful news. You're an inspiration to all of us living with mets. I've been procrastinating about buying a new camera and lenses - the old "will I be around long enough to get the use/justify the expense" routine. And having read your post, I've made up my mind. Carpe diem - seize the day! That's wonderful news - enjoy every single moment, they have been hard won and all the more precious.